For those who believe there is something better than what’s in the big box stores. Looks/Feels like wood, impervious to the elements! (formerly Western Spindle) We are a family-owned shop dedicated to creating quality custom porch balustrades that complete your home or commercial property and that always exceed expectations. No matter the size of your project–from a few feet of roof top railing on a portico to supplying a series of hotels at a resort–we pride ourselves in delivering quality porch railing & spindles and other architectural millwork to your door fast and easy, and right when you need them. Listed below are some of our best-selling Porch Railing & Spindles, plus other custom porch solutions. The spindles and rail came yesterday, I absolutely love them. I wanted you to know that and how impressed we are with the quality. We will definitely be using you again! How long will my Porch Railing order take? For current LEAD TIMES and shipping transit time, click here. We have tried to make your experience as fast & smooth as possible. Getting your new or replacement porch railing is easier than you think. If you’re looking at new railings, start by looking at our Shop By Size categories. For example, click our best-selling 6″ Wood Balustrade. Or if you prefer a man-made alternative to wood, click on 5 1/2″ Poly Balustrade, which is our best-selling “composite”, low-maintenance railing alternative. If you’d like us to custom reproduce your existing balusters, just send us an email to [email protected] with a picture, dimensions, and quantity. Next we’ll send a quote for your baluster & railing restoration. If you like the quote, we’ll have you send us an original for exact replicas to be produced (or we can go off a picture or drawing if “close” is good enough). 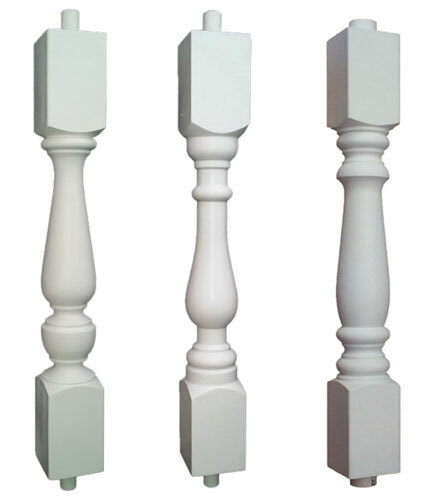 Many people are intimidated by the thought of shipping large balusters and railing. Don’t be. We’ve got it handled. Our team includes professionals that are experts in shipping large porch products in a safe and efficient manner. Add products to your shopping cart and the shipping cost will be displayed. Porch railing & spindles is often the last thing to add to a project, and often the last thing you think of. We’ve made it easy to clean up this last minute, but very important exterior architectural element. Build the reputation of being an architect that specs products that are beautiful, safe, tested, and easy to install. For builders and construction managers, productivity is your greatest ally. We have invested in equipment and processes that allow us to make product quickly. It’s available right when you need it. And our balustrade systems are thoughtfully designed so that it can be installed efficiently, saving you labor. We can further save you time by doing the take-offs here in house. Just send us the plans and we’ll come up with a parts list and a quote. In the Drawings & Technical Documents page, you’ll find important items like CAD drawings (PDF & DWG), 3 Part Specifications, Structural Test Reports, etc. Installation Instructions are also posted. We aim to make your job easier. And it’s all right here online so in the highly unlikely chance you’re working on your project after hours (right? ), you can still get the balustrade specs you need.